Missing something in Mumbo's Mountain? Let the shaman transport you back so you can find it. 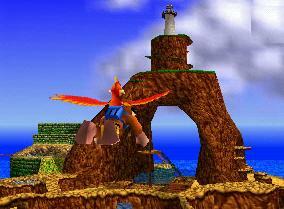 With Mumbo’s Mountain behind us, we’re finally heading into Grunty’s Lair proper. There’s a lot of stuff to do and see, so let’s get started! From the entrance of the lair, head to the left of Grunty’s picture. Use the Talon Trot move (Z+LeftC / Trigger+Trigger) to climb that slope we couldn’t last time. At the top you’ll find Bottles and your very first Note Door. 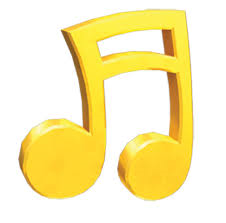 To go through this puppy you’ll need at least half of the notes from Mumbo’s Mountain. Punch on through once you’ve got them. Fun Fact: Kazooie seems to really like calling Bottles by his brother’s name. Bottles seems to really like ignoring her. On the other side you’ll find yourself in a large chamber with a mural of Grunty’s face on the floor. Clearly vanity is not lost on this woman. First head left along the wall to the opening and down the stairs. At the bottom is a magic cauldron—approach it to “activate” it. Later in the game this guy will prove to be a handy shortcut through Gruntilda’s massive lair, so be sure to wake up all the cauldrons you see. 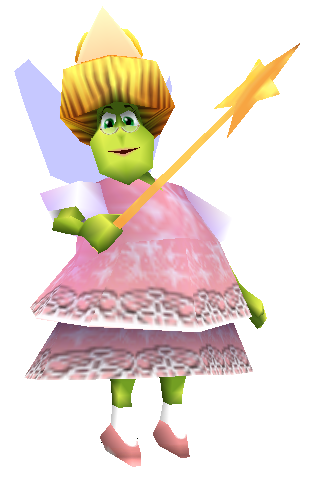 There’s also a Mumbo’s token behind the cauldron against the wall. With that out of the way, head back up the stairs and across the room to the fairy in the pink dress. That’s right, she’s Grunty’s sister (one of many) and she has all the dirt (gossip) on Gruntilda. Believe it or not, you’ll need these tidbits later in the game, so talk to Brentilda whenever you see her. Oh, and each time she has three things to tell you and she’ll refill your health when she’s done. How nice. Next, just to the left of our helpful fairy is a patch of sand and a Jigsaw puzzle! I know you can see the other one in this room, but we can’t reach it yet—this is the one we want. 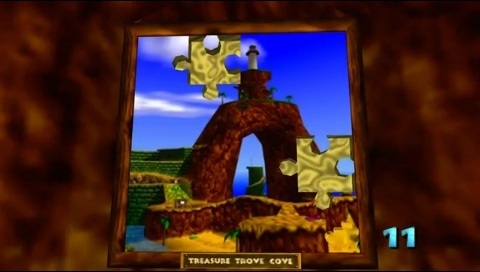 Throw in two Jigsaw pieces to open Treasure Trove Cove. Now we just have to get there! From the Grunty mural in the middle of the room, head up the mossy ramp and through the opening. There are a few side missions we can do in here, but if you want to head straight to the next world, jump down the waterfall, go through the opening with the glowing red eyes above it, and jump in the treasure chest. 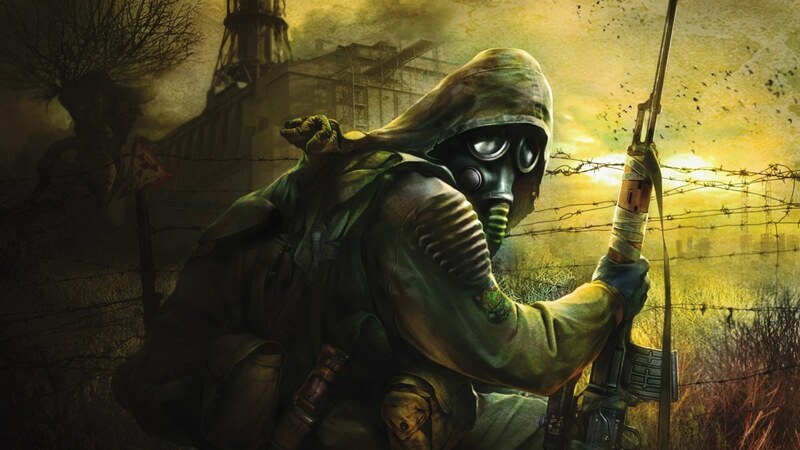 For side missions, first head to your right through the pipe that’s pumping out water. On the other side, climb on top of the pipe (which somehow shrunk?) for a Mumbo token. There’s also another cauldron in here—and no, it’s not the same color as the other one, though they are similar. The first time I played this game I got really mad that my shortcut didn’t work, but that’s because it wasn’t one—this cauldron is red, the first one was pink. Head back to the last room and down the waterfall. Underwater, opposite dry land is a passage—take it. In one corner of this room a Mumbo’s token hides behind a tree limb and in another corner is Brentilda. Once you’ve heard all she has to say, head out the way you came in, onto dry land, through the opening with the angry red eyes. The giant treasure chest in this room is our world entry, so hop on in! 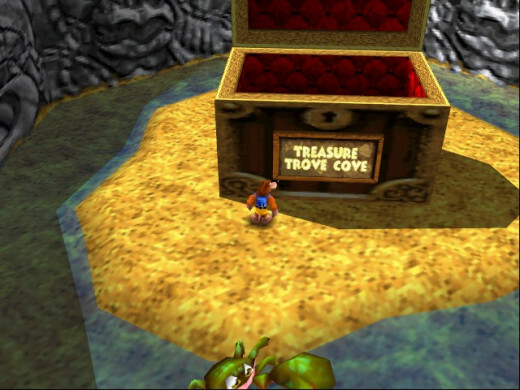 Treasure Trove Cove's world entry/exit is both appropriate and more exciting than the lump of rock that served as Mumbo's Mountain's entry/exit. Get excited--you'll be able to do this soon. Any of the isolated ponds in Treasure Trove Cove that are surrounded by land on all sides are safe to swim in, but put one furry toe in the ocean and you’ll have to deal with Snackers. Snackers is a fast blue shark hell-bent on eating bird and bear; describing them as various food items each time he senses them in the water. You can swim, doggy paddle, and A+A jump away from him all you want; he’ll catch you, bite you, then chase you some more. He’s a downright pest. So how do you deal with him? Eggs. Go into the water just enough to lure Snackers out of the depths, then quickly hop back onto the beach. Crouch and shoot eggs at him until he disappears. Repeat until he “dies.” You’ll have a Snackers-free ocean for a few minutes until he returns. If you feel like getting rid of him again, he’ll take fewer eggs to knock out if you do it right away, while he’s weak. It’s impossible to get rid of him for good, but at least you can buy yourself short reprieves from his tyranny. While running from him, you can also hop up on dry land or the many conveniently placed crates to get away from him. After a few seconds he’ll disappear. For the most part it’s best to stay out of the ocean—you don’t want to be his cheese and crackers. From the world entry, follow the path to the left. This giant hermit crab is kind of hard to miss. Offended by Kazooie’s snarky attitude, he decides to fight you. Stand just out of reach of those big claws and wait—this is all about timing. Nipper clips the air with his claws four times, then spreads his arms wide for a few moments, then goes back to giving the air a haircut. While his arms are wide open, dash in and peck his eyes (A+B / A+X), then dash away. Repeat this three times and he’ll surrender, retreating into his shell. Follow him to discover he’s disappeared…and left you a Jiggy. That’s a fair trade. ACHIEVEMENT ALERT! For beating Nipper, you’ll get the KNOCK OUT NIPPER achievement. Nice work. Note: The little crabs you see inside Nipper’s shell are not only annoying, they’re everywhere in Treasure Trove Cove. The quickest way to dispatch them is to jump above them and hammer down with Beak Buster (A+Z / A+Trigger). This neat trick also nets you two recovery units instead of just one. Feel free to go nuts. From the world entrance, head straight ahead. See the hippo on the deck of the ship? Climb the right or left side of the ship to the deck and head on over to him to find out what’s the matter. Not only can the hippo, Blubber, not find his treasure, he can’t swim! No wonder the poor guy’s so depressed. Climb the mast from the dock if you want a Mumbo token. Next to the mast is a depression in the deck. A+Z / A+Trigger it to go below deck. Swim down for another Mumbo token and a big ol’ lump of gold—half of Blubber’s treasure. You can see the other half, but we can’t reach it from here. Jump on the crate and jump again to get back on deck. Jump off the ship into the water closest to the world entrance. One of the cannon windows on the side of the ship is open—swim in for the second half of the treasure. Head back up on deck and approach Blubber to give him his treasure in exchange for a Jiggy. Fun Fact: Blubber’s not kidding about all that spending he’s planning on doing—the next time you see him in Banjo Tooie, he’ll be totally broke. When facing the Salty Hippo, follow the path to your right a little ways and climb the stack of boxes. MOVE ALERT, SHOCK JUMP SPRING: Using the green pads with a picture of Kazooie’s feet on them you can jump to (supposedly shocking) new heights by pressing and holding the A button. After the initial press you can move the joystick to bounce the jump to a new starting location and then you can move the joystick again in midair to really further your distance. Jump straight up from the Shock Spring pad next to the molehill for a Mumbo token. Using your new move you can hop along the pillars next to the molehill. The ones on the left lead up to a cave with the Jiggy. It's Hard to Have Confidence in a Bucket Named "Leaky"
First head to where Bottles taught you the Shock Jump Spring move. Rotate the camera until you can see the ledge with the colorful bucket on it. Hop down to this ledge. Stand with Banjo’s back against Leaky, and then shoot some backwards bouncing eggs (Z+DownC / Trigger+B). Two eggs and his leak is patched. Hop down and enter the Sandcastle. The crab inside challenges you to “solve his puzzle for a prize.” It’s not a very good puzzle when the answer’s on the wall, crab. Using Beak Buster (A+Z /A+Trigger), enter “BANJO KAZOOIE” within the 100 second time limit. You can’t use the same tile twice, so you’ll have to find all three O’s and such. When the gate opens, the crab, furious that you outwitted him somehow (the answer is on the wall, you cheeseball! ), decides to attack you. Beat him up and take your prize. Be warned—he’s a little tougher than the standard crab so he’ll take a few extra hits. ACHIEVEMENT ALERT! Now that you’ve unlocked the Sandcastle, you can head all the way back to Banjo’s house in Spiral Mountain to try your hands at the JIGSAW MASTER achievement. Inside Banjo’s house, go into first person view with Y and look at the picture of Bottles. 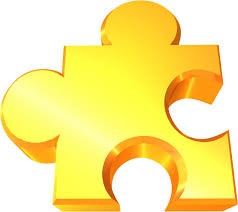 He’ll challenge you to solve actual puzzles within a time limit—beat all seven for the achievement. N64 users can also do these puzzles—enter the codes Bottles gives you at the Sandcastle for some giggles. From the world entrance follow the path to the left past Nipper (or his shell). Use the Shock Jump pad to reach the ledge above. Past the treasure chest, up the ramp is a series of little ponds. Head past them to another Shock Jump pad and go up again. Past another pond and a mine to another Shock Jump pad (this is the last one, I promise). This time there’s a large pond with a mine sitting smack dab in the middle of it. Directly underneath it, at the bottom of the pond, is the Jiggy. You have two choices: swim to the bottom, then back up and out as fast as you can, avoiding the mine OR just swim into the thing so it blows up and take your time swimming. The mine only does two damage so if you think you can take it, go for it. Extra Life Alert! Look back the way you came to see a ledge in the mountainside with yet another pool of water, and an extra life. What’s with all these pools? Is All This Jumping Really Necessary? 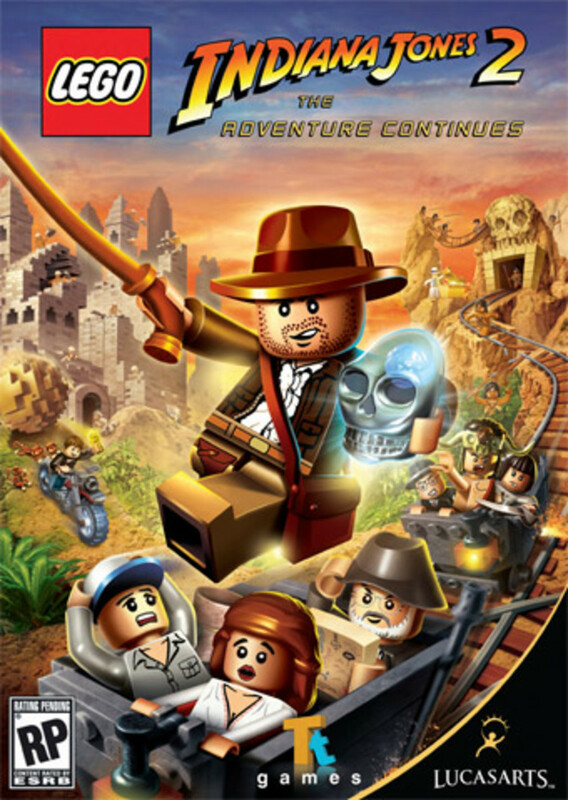 From where you got the “Spelunking With Balloons” Jiggy, head past the deep pool and down a series of steps/ladders. The treasure chest has a whopping two Mumbo tokens in it (you rarely see more than one together)—time your jumps to get them. I recommend the Z+A / Trigger+A jump. At the bottom of the ladders you’ll see a thin ledge following the wall (to your right if you’re facing the ladders). Walk along that ledge, then get ready for some plat-forming. Hop from crate to floating crate, then up onto the next ledge. If you fall off, you can get back up on the middle crate. [SNACKERS WARNING!] Keep jumping from ledge to ledge. The last one has the Jiggy. MOVE ALERT, FLY: Head to Blubber’s ship, the Salty Hippo, and climb the rope ladders to the mast. Here Bottles teaches you how to fly. You can land anywhere, but you can only take off from a flight pad, so there are limits to when and where you can fly. While flying around, you’ll gradually sink toward the ground. A quick tap of the A button pulls you back up a bit, but uses a red feather. Tap A a whole bunch of times and you’ll burn through those things like nobody’s business. Steering right and left is simple enough—right goes right and left goes left, and you can even turn more sharply if leisurely turns aren’t quite cutting it by using the L+R buttons or the Left and Right Bumpers. Once again though, Banjo Kazooie insists on inverting your vertical steering, like it does while you’re swimming: down points Banjo’s nose up, up points it down (for a solid landing). It’s less obnoxious here than it is underwater because you very rarely need to aim up in the air when you can just press A to fly higher. Oh, and don’t press Z / Trigger while you’re flying unless you want to plummet beak-first to your death. I don’t know why that move isn’t disabled while you’re flying; I can’t begin to count the number of accidental death plummets achieved because of it. From the world entrance, head right along the path, past the Sandcastle and the Shock Jump pillars. Head up the little ramp, jump over the gap in the walkway (and an Extra Life which totally isn’t worth getting eaten over [SNACKERS WARNING!]) and climb the spiraling path to the top of the green pillar. There’s a giant, totally obvious red X up here, and every pirate worth his salt knows what that means! A+Z / A+Trigger the X to reveal an arrow. Using the flight pad, fly the direction the arrow points. Ahead and a little to the left is the next X. Land and whack it, like before, to reveal another arrow. 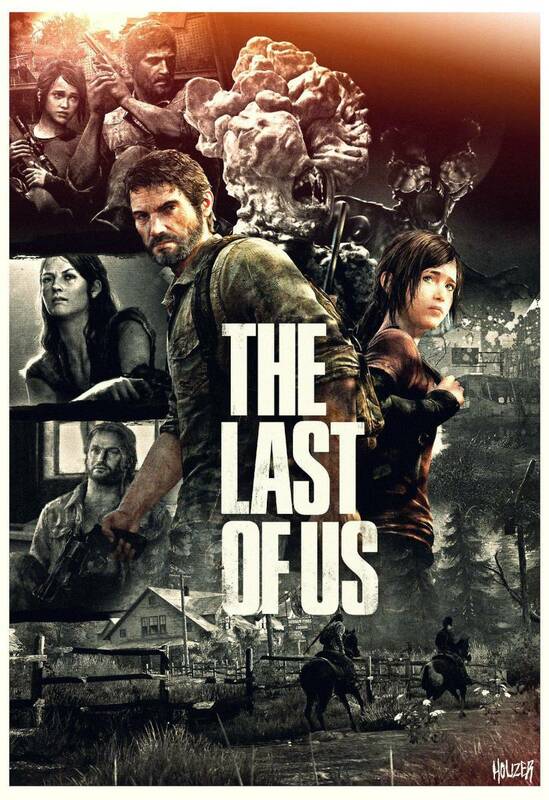 Keep this up until the treasure gets as cheeky as Kazooie and turns the X into a ? instead. The X hasn’t moved far—it’s on a little island below and next to the pillar you’re standing on (move to an edge and rotate the camera to spot it). When the box comes out, break it for your Jiggy. Also, there’s a Mumbo’s token in the water behind the pillar where you saw the ?. Head back to the top of the mast of the Salty Hippo, where Bottles taught you how to fly. Stand on the flight pad, face away from the molehill and look straight ahead and to your left—you’ll see a large treasure chest with eyes. Fly to the cave where it sits and land there. Timing your jump so you land inside his mouth, use Z+A / Trigger+A to grab your booty. Jumping just as he’s opening his mouth usually does the trick. [SNACKERS ALERT!] There’s a Mumbo’s token on a crate below this cave. Watch out for that hungry blue shark. Directly opposite the Grunty’s treasure cave is another cave. Land in it and climb the steps. You’ll find yourself on a plateau far above the rest of the world. Be careful not to fall as you make your way around the pillar in the middle of the plateau to find the ramp leading up it. At the top you’ll find a lighthouse. Break down the door (Z+B / Trigger+X, you vandal) and head inside. There’s a Mumbo’s token in the door. Head inside and then walk around behind the ladder you just climbed to find a Shock Jump pad. The Jiggy’s on the tippy top of the lighthouse. Which, by the way, doesn’t appear to have a light. No wonder Blubber crashed. Behind the lighthouse (opposite the door) lies this switch. Whack it before you head back down to the rest of the world. The Jiggy appears back in Gruntilda’s Lair, on a platform above the entryway into the room with the Treasure Trove Cove’s entrance. Jump on the cannon that’s sticking out to reach it—it’s on the highest part, to your right. BLUE: Underwater under the platform with the world entry/exit. [SNACKERS ALERT!] Do yourself a favor and take out Snackers before you go swimming—it’ll make your life a lot easier. GREEN: On top of the mast of the Salty Hippo, above the molehill. ORANGE: On the highest of the mine pond ledges, on a spindly bit sticking out over the lower ledges. PINK: On top of one of the Shock Jump pillars. YELLOW: On top of a tree near the lighthouse’s pillar. Jump or fly to him (note that flying takes a LOT of feathers). Just be really careful getting down—jump to the plateau with the lighthouse’s pillar or you’ll slide down the mountainside and fall. [SNACKERS WARNING!] I’m detailing these separately because both of them require a swim. If you’re fast, you can knock out Snackers and grab them both in succession. Empty Honeycomb #1: Above a box floating in the water near treasure island and the Shock Jump pillars. Empty Honeycomb #2: From Nipper’s beach, swim right along the wall. It’s underwater where the brown and green walls meet. 4 on the platform with the world entry/exit. 4 below the deck of the ship, underwater. 4 inside the ship from the side entrance, underwater. 8 on the trees near the Salty Hippo. 11 on the rope ladders on the Salty Hippo. 6 above the treasure hunt’s final location, on the large pillar near the Shock Jump pillars (where the ? appears). 3 above one of the Shock Jump pillars. 4 inside a treasure chest between the Shock Jump pillars and the start of the treasure hunt pillar. 5 on top of the Sandcastle. 4 inside the Sandcastle, in the pools of water. 3 in the ponds near the mines (lower ledge). 12 on the steps/ladders near the mine pools. 4 on the path to the treasure hunt start’s pillar. 12 along the paths between the mine pond’s lowest ledge and the molehill for Shock Jump Spring. 1 in the cave leading to the Lighthouse. 3 on the ramp around the pillar leading to the lighthouse. 5 on the deck near the top of the lighthouse. 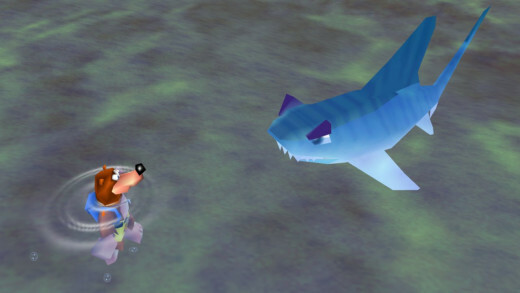 Next time on Banjo Kazooie: a cute, but sad garbage grinder; some mutant crabs, and lots of deep sea diving. Get ready for Clanker's Cavern, everyone!